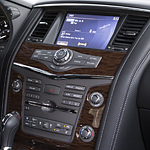 The new Nissan Armada is a large, roomy, and powerful SUV. While this powerful vehicle performs admirably under regular highway conditions, it also has specialized features that allow it to do more on the towing front. These features include specially designed structural members as well as active suspension components. The new Armada boasts a robust 8500-pound towing capacity. A specialized independent rear suspension and special box frame underlies this towing performance. Towing 8500-pound loads can take a toll on most suspensions, but the new Armada includes a special active braking limited slip system. This system can prevent destructive and dangerous wheel spin by deftly applying braking pressure to the necessary tires. Working hand in hand with the active brake system is the Hill Start Assist system that helps drivers to move loads up hills without anxiety. Each of these technologies promote increased stability and safety.